Full Landscape Design / Build - Bellaire Landscape Inc.
Curb Appeal! Curb Appeal! Curb Appeal! Landscape has a resale value worth far more, dollar per dollar, than interior renovations! Let Bellaire Landscape revamp your home and increase the property value of your home! Bellaire Landscape offers state-of-the-art landscape design, consultation and construction. Our expertise in the landscape industry comes from years of experience. We strive to provide the best possible landscape services and ideas to our clients. Each customer has their own unique idea of what they would like their landscape project to look like. Bellaire Landscape has the expert knowledge to tackle diverse landscaping projects of various scales. With a strong sense of design and attention to detail, our fresh and progressive landscape ideas let your garden encourage distinguished purpose. Transform your backyard into a relaxing oasis! Bellaire Landscape will collaborate with you, exploring your landscape ideas in the initial consultation phase. Our landscape architects will then construct a design layout or landscaping plan that best suits the area you want beautifully transformed. Next, our team of landscapers will put the landscape design plan into action by building the outdoor paradise you deserve. Resulting in you being able to enjoy nature with trouble-free and reliable landscaping jobs completed in a professional and courteous manner. A beautiful garden with fragrant annual and perennial plants with the sounds of a nearby splashing water fountain. Any water feature provides visual and auditory pleasure while soothing and relaxing you and your guests. Specimen trees provide shade and colour throughout the summer while winter brings forth a show of stately branches. 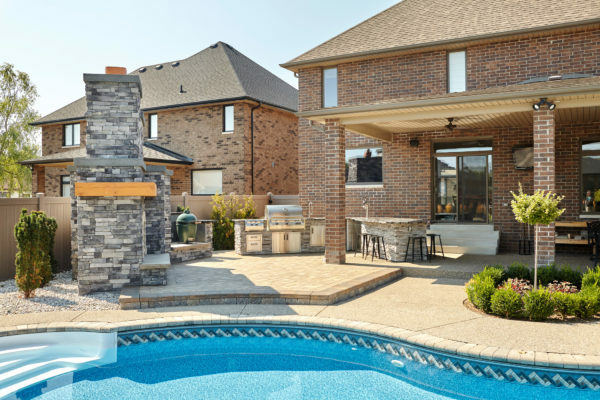 Maybe your idea for your backyard is a place where children are splashing and playing in a Rico-Rock waterfall accenting a lagoon-style pool. 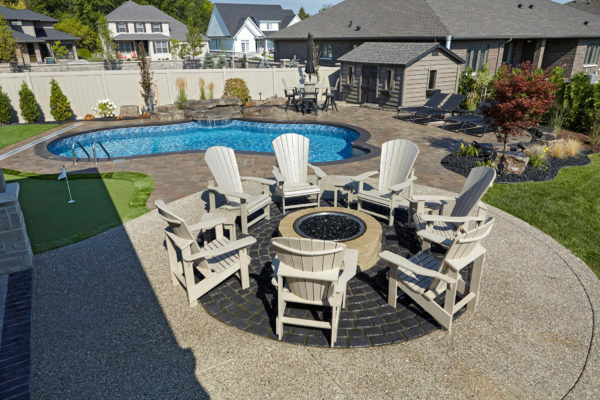 Friends and family are over sitting atop your new decorative stamped concrete patio enjoying an appetizing barbeque.